Kramer the cockatoo is going to bring out your inner kid. 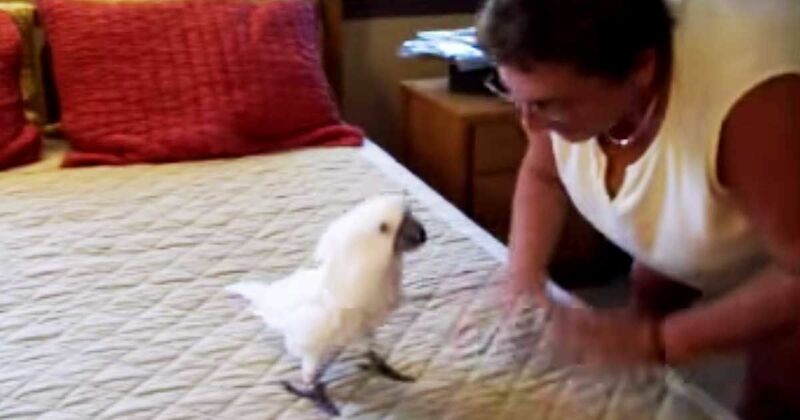 In this viral Youtube video, the fluffy little bird excitedly jumps and bounces across the bed like a toddler and is bound to bring a smile to your face. The clip starts with Kramers mom tapping the bed and telling him, " Jump Kramer, Jump!" and her feathery little friend does just that. Lifting his wings up, and hopping across the mattress and bobbing his head. But at one point Kramer stops at the other end of the bed, looking back at his mom as she cheers him on. It doesn't take long for Kramer to get back into the game, though, bobbing, bouncing and hopping back across the bed to his mom's arm. The video is too funny and cute not to miss! Be sure to check it out right here below. Share this hilarious video of Kramer with your friends on Facebook, Twitter and Pinterest.